Alcohol is linked to seven types of cancer including bowel cancer. It is estimated that about 6 out of 100 bowel cancers (6%) in the UK are linked to alcohol. For cancer prevention, it’s best not to drink alcohol at all. If you do drink alcohol, keep it as low as possible with an upper limit of no more than 14 units a week and try to spread it out over the week. Remember to have at least two alcohol free days a week. This recommendation is for men and women. 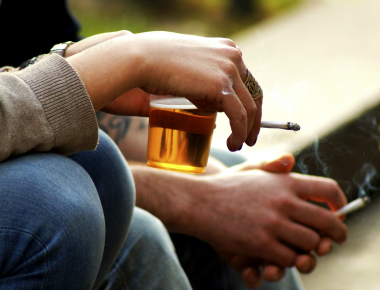 An estimated 7% of bowel cancer cases in the UK are linked to tobacco smoking. Bowel cancer risk increases with the number of cigarettes smoked per day. We know that smokers are more likely to develop polyps (non-cancerous growths in the bowel) which could turn into cancer if not discovered. If you want to give up smoking, your GP can help, advise and refer you to an NHS Stop Smoking service. These services offer the best support for people who want to give up smoking. Updated August 2018. Due for review March 2019.